These sheer, mesh covers are acoustically transparent. 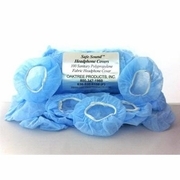 These are perfect for the busy practices, schools or industrial screening. They keep headphones clean. New improved softer material. Sold in bags of 100.